The Perfect Pout: Why do we want Lip Fillers? You might think the popularity of Lip Fillers and bigger Lips is a relatively new obsession however scientists first started injecting lips in the early 1900s to make them bigger! Though there is no such thing as perfect a formula for the ideal lip was created by Leonardo da Vinci himself! The Golden ratio is 1:1.16 meaning that your bottom lip should be .6 bigger than your top lip.The shape and actual size of your lips depends completely on your face shape and how they relate to other features on your face. How do we get Perfect Lips? I’ve lost volume in them as I’ve gotten older. It very important to only get lip fillers for yourself and no one else, this may also mean dealing with criticism and remarks like ‘oh but you’re beautiful without them’ and ‘you’ll regret it!’ . Usually these are from your mother. 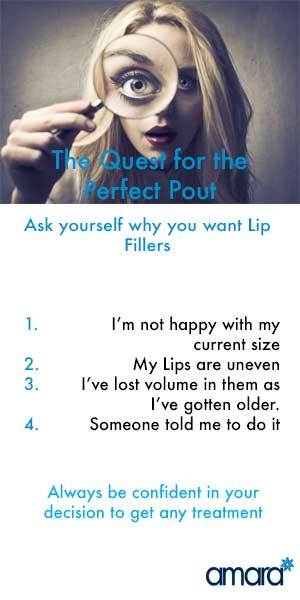 The point of Lip Fillers and other non surgical treatments are to restore confidence in yourself. Only get any treatment if you are sure it is 100% right for you and not because someone else is encouraging you to. Whats involved with Lip Fillers? Book a consultation with a doctor that you’ve researched (check their reviews and the product they use). A good doctor will guide you through your options as well as the procedure – they should never make you feel pressured into getting any treatment or adding on anything extra to what you are currently getting, yes they advise you on a full treatment plan but never push you. Your doctor will show you the areas he is going to inject (its different for every person) and where exactly the filler will be placed. Remember to take before and After photos (your doctor may do this for you) so you can see the difference. Its also important to keep these photos for 6 months down the line, you’ll have gotten so used to your lips that you might convince yourself it’s completely worn off! Are you interested in learning more about Lip Fillers? Book in for a free consultation now!